We start with Jumbo Runner peanuts toasted right in the sugar with butter, sea salt, and real vanilla. The sugar’s cooked long enough to have complex caramel ﬂavors and to shatter and crunch when you munch it. It’s hand pulled for maximum brittleness and crispiness. 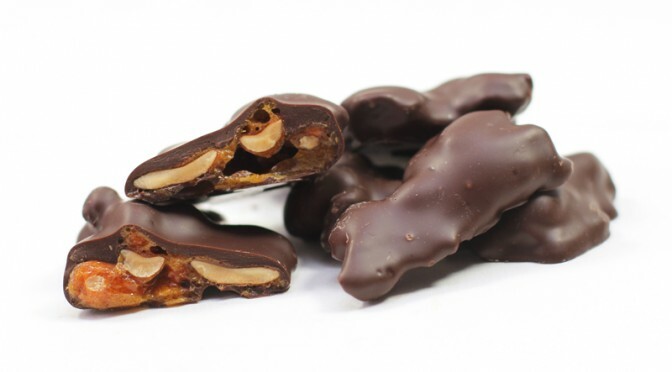 Then the peanut brittle is coated in our own blend of fabulous, luscious 62% dark chocolate. Up front is the well-balanced dark chocolate, followed closely by the sweet and savory caramel notes of that crunchy, crispy brittle. Then the nutty, toasty, savory peanut ﬂavor kicks in, followed ﬁnally by a little balancing sparkle of sea salt. Contains milk, peanuts, soy. May contain tree nuts, egg.